For completeness, this analysis should indicate how much of a contribution all these actions have to the global production of GHG. The answer is: Not Much. Knock yourself out if you want to live like an ascetic, but it isn't going have much affect on the environment. It will have a big affect on you, though. Stop making babies. It's the most effective measure by far. To paraphrase the old saw: "Don't think, and act selfishly" as you preach, is going to have a magnified EFFECT on the end result of you and your kind's pooh-pooh-ing. Yes that was intentional. With the natural knock-on EFFECT of you and your kind ending as what's for dinner. Pay now or pay later-- but you will most assuredly PAY. When our overlords who are pushing the GW scam start doing what they want the prols to do, I might start taking it seriously. More broadly, what are you arguing when you say these are all pointless changes? That unless _one change_ solves _all the problems_, it's not worth doing? Because of course there's only so much one person can do. Changing one's single impact is a nessicary part of _everyone_ changing their impact. Carbon footprint, shmarbon footprint. The most effective measures against global warming are the large-scale ones, not the individual ones. Ocean fertilization and nuclear energy are the most important in my opinion. The "have one fewer child" recommendation is really silly, it is the only one among their recommendations whose effects cannot be reliably predicted. Note their mention with the star above it: "Cumulative emissions from descendants". Nobody can say what emissions descendants will have. In fact with current technological trends, it may well be expected emissions per capita will plummet by the next generation. They also missed the "don't buy high-tech / computers / smartphones / industrial products" recommendation. And the one saying "eat all your food, don't throw it away". And the one about living without air conditioning. And the one saying you should go to sleep early. For one thing the industry should stop the fashion of changing one's gadgets every so often. And make reliable devices. Like a fridge with 10 year guarantee and the possibility of easily repairing it after that. The government of any western country would never ever support a reduction in having children as they are the countries future (cash cow's) and are needed to support an aging community. Also as we push for more renewable energy we are using more of the agricultural land to produce bio-fuels and Biomass (wood pallets etc) so we have to destroy more forest to produce produce (fruit and veg) and land for wind turbines. How is this better? What's Leonardo DeCaprio's private jet's carbon footprint? After making all of these life style changes since 2011 I'm pleased to say I'm healthier and more fulfilled now than I ever was before. The pollution from construction of a new vehicle alone is enough that it's unlikely in it's entire lifetime to offset it. Keep the car you have for as long as possible, even if it's a gas guzzler, that's way more efficient that digging yet more resources out of the ground. Or just happily ignore the "man-made global warming myth" which has no observable evidence to support it and enjoy your life. There, doesn't that feel better? Myths make entertaining movies but, like vampires and zombies, they aren't real. There it is, the goal for propagating the CO2 lies of the AGW Cult. Population / human control. But we need to be having more children in order to pay future pension's burden! I noticed that it was corporates first action that was required. Where are the railroads to replace planes? Where are the green roofs on manufacturing plants? Where is the corporate communication between nations? Where is the corporate guarantee your mortgage can be paid off while living locally? When you have Quality of Live you aren't careless with your reproduction. Look at the weather maps and see the enormous overlayment of CO2 and CO that centers on the US and runs over the waist of Africa. We are told the CO of Africa is from crop residue burning but here in the US we have as much or more due to technology. What is the difference? If you want an immediate boost to the economy, bring 90% of the overseas military home. The economy will boom like never before. The Bush Buddies now reaping the huge profits from supplying will hopefully then disappear. "Carbon footprint, shmarbon footprint. The most effective measures against global warming are the large-scale ones, not the individual ones. Ocean fertilization and nuclear energy are the most important in my opinion." Yep, Giggler here presents the central complaint --ie, "thinking"-- of the Denierside, which can be stated: I don't believe in AGW because it requires me to give up some level of personal comfort and make changes to my personal lifestyle, and encourage others to do likewise. Therefore, the much hated Big Gubment must vastly overpay our Corporate Overlords to deploy unproven methods to treat topically the effects of AGW rather than its causes. This is the same logic that leads them to bankrupt themselves for medical treatment of diabetes, obesity, heart disease, and cancer --instead of eating far less processed/packaged foods, and more fresh/organic. Lazy, lying, selfish, and hypocritical Denierthink. "For example, a woman in the United States who adopted the six non-reproductive changes in Table 3 would save about 486 tons of CO2 emissions during her lifetime, but, if she were to have two children, this would eventually add nearly 40 times that amount of CO2 (18,882 t) to the earth's atmosphere...."
It may be difficult to suddenly reduce one's carbon footprint, but there is another way we can help in minimizing climate change. We can increase the 'albedo effect' of our cities. We should paint our rooftops white and this will increase the sunlight reflected back to space. Odd that three of the items are about buying a new car, but no mention of driving fewer miles. Cars that use less energy only promote longer commutes: the auto mileage rules gave the US our superburbias. If you live a mile from work and shopping (I do), the energy source of your vehicle matters very little. Ya know...closing your eyes, plugging up your ears, and going "lalala" at the top of your lungs is not the same as "there is no evidence". Just because you don't want to read it (or don't have the educational background to understand it) doesn't mean it isn't there. Work on increasing your Eddington number, Strava is a great help, you'll be amazed at the places you'll go. You may even go trans-continental.. I'm guessing this is based on the US, with this logic, wouldn't restricting immigration achieve the same ends? What is the point of having fewer children when more people will just immigrate in, apart from replacing the Anglo population with people from the second and third world? FYI, I don't deny global warming. In fact I believe it is real and man-made. But you don't treat a global problem with individual defensive measures. You tackle it with global, offensive and appropriate measures, i.e. don't target humans but the warming; and since we actively cause it, we should actively fight it. Don't reduce the human impact at all costs (but rather by progress), but best cause global cooling to compensate said warming. Anyway, it would be somewhat ironic if Earth went through an asteroid impact or nuclear winter; then the cooling will be far more severe than the current warming. Then we would probably resort to burning anything we can just to warm up the air and avoid starvation by crop failure. But one should note nuclear power can combat both winter and warming - though in different ways. That study is silly since: 1) it is based on simple extrapolations done with current figures; 2) it computes the carbon legacy of an individual by his whole lineage (descendants) until the lineage is extinguished (or up to a fixed time limit). E.g. : according to Table 1 in that study, a US woman living 80 years would give with each child it has an average lineage going for another 470 years. Now who in his right mind would believe current scenarios are valid for the next 470 years? That is simply absurd. The conclusions of the study are exaggerated. I don't think we need to have ZERO children, a replacement level of 2 children per female would keep the population steady but not growing. Unless of course we've already exceeding the carrying capacity of our environment in which case maybe 1 or 1.5 is a better bet. As ridiculous as everyone made it out to be, China's 1 child policy has done an excellent job of managing their overpopulation. I'm guessing a worldwide genocide might make a dent in CO2, and that unfortunately seems the most likely future for most of us the way things are headed. Sun Frost Refrigerator RF 16 I think, R 134 refrigerant, 19 years and still going strong, no loss of refrigerant yet. Progress is the key. A large population is a big asset; if they are well educated, people can innovate and find ways to reduce fossil fuel use. That is the best way to go. Progress is the only variable that is not taken into account in these matters, but we all feel it. It is amazing that in a couple of years LED light sources replaced a large portion of the oldest types of lighting and they will probably become the most important in this field in a couple more years. That is the kind of innovation that should be pursued, not some dubious and unachievable individual measures. Mine is almost 40 years old; it was repaired a couple of times and is still functioning. I have to replace it because it eats a lot of energy. So the technology to build reliable devices exists since the previous century, it's the companies' management that should pursue it. I don't see why it's so. Anyway, if you compare global warming (GW) to genocide you may find something interesting: GW is not that bad really. There were times in Earth's history when it was far warmer than it is now. Ecosystems may change, some species may disappear, but the environment will still be there. It will look different, yet it's hard to believe it will be as different as during the Cretaceous or Paleogene, when it was really warm. On the other side, global genocide may affect nature in irreversible ways, far more than GW. A global nuclear war could send Earth into a decade-long winter, many times greater in amplitude and speed than the GW, with a higher shock effect on nature. After that war, one can realise humans will have far less concern for nature. They'll get what they want, no matter the effects. Is space cold or hot? There are no molecules in space so our common definitions of hot and cold don't apply. The temperatures of objects in space, e.g. the earth, moon, space station, mars, venus, etc. are determined by the radiation flowing past them. In the case of the earth, the solar irradiance of 1,368 W/m^2 has a Stefan Boltzmann black body equivalent temperature of 394 K. That's hot. But an object's albedo reflects away that heat and reduces that temperature. The earth's albedo reflects away 30% of the sun's 1,368 W/m^2 energy leaving 70% or 958 W/m^2 to "warm" the earth and at a S-B BB equivalent temperature of 361 K, 33 C colder than the earth with no atmosphere or albedo. The earth's albedo/atmosphere doesn't keep the earth warm, it keeps the earth cool. Without quantitative supporting evidence, your comment is just naysaying. Given this is a science website, perhaps you'd like to provide your references for this? The authors have their references, what do you disagree with? Going car free is the option they provide. That's the logical extreme of less miles. "FYI, I don't deny global warming. In fact I believe it is real and man-made. But you don't treat a global problem with individual defensive measures. You tackle it with global, offensive and appropriate measures, i.e. don't target humans but the warming; and since we actively cause it, we should actively fight it. Don't reduce the human impact at all costs (but rather by progress), but best cause global cooling to compensate said warming." "...it requires me to give up some level of personal comfort and make changes to my personal lifestyle, and encourage others to do likewise. Therefore, the much hated Big Gubment must vastly overpay our Corporate Overlords to deploy unproven methods to treat topically the effects of AGW rather than its causes." Just so that you can make 8 trips to the store a week, instead of PLANNING just the one necessary. Actually, what this article proposes are unproven methods that in fact would fail if implemented. You can't expect millions of people to behave in a certain way. If you do, you will most probably fail. That is another reason why it's better to apply large-scale means against GW, not individual ones. Nuclear energy to replace fossil fuels is one of them; thorium breeder reactors would use fuel more efficiently and with less nuclear waste than conventional reactors. Ocean fertilization may not have been proven yet, but it is researched and it is a big bet against GW. -Except that religion-driven overpopulation is the greatest threat the world faces today. The major religions have all survived by outgrowing and overrunning their now-extinct adversaries. If anything the process has gotten more intense. Their gods promise to provide for however many children they can bear. But these gods never do. Instead they blame their enemies for the starvation and misery. Religions depend on overpopulation. They thrive on it. All of them. So I guess you could say that in a very real sense religion is responsible for AGW. And what is the carbon footprint of standing armies and regional conflict? As I said, we should bet on progress in the fight against GW, not on reducing population or comfort and so on. It would be good if people became more frugal, but again, more people, coupled with education, is an advantage and not an impediment to the human race, politics, the environment and so on. We should end up with this materialistic, consummerist mentality that reduces humans to mere figures and start seeing the full potential of each person, of his intelligence and then bet on those instead. And then, it's not humans who look for having more, it's the whole humanity as it is today, including the economy and its producing agents. One cannot blame the average Joe for all evils and simply skip on the big companies and retail stores who are so eager to have you buy, buy, and then buy some more even though you may not need it. They encourage wasting resources by milking the average Joe of his money. That is a big part of the picture, really. Some "scientific" chart! Number one is missing! What do trees do? Trees absorb carbon dioxide and potentially harmful gasses, such as sulfur dioxide, carbon monoxide, from the air and release oxygen. Hey, but why not miss the obvious. How do you restore really damaged environments? You plant trees! In other words, two birds with one stone, if you plant lots and lots and lots of trees. Do we have proof of what trees do, ask all those individual people who have saved areas that the governments of their nations and their local areas gave up on by just planting trees. Look it up, the evidence is right here in the internet. You can watch many videos about what simple people have do. Everyone seems to be ignoring the most obvious, No. 1, impactful effect on the environment - human addiction to blood. Our addictions always ignore immoral and unethical behavior. Flesh eating, and all the cruelty and ungodly behaviors that we permit for this appetite, also jade our sensitivity to each other and make wars so easy to glorify. Animal agriculture uses more electricity, more water, more energy, cuts down more forest for grazing land than anything else. Animal agriculture contaminates the soil, water and air. The eating of flesh is an unhealthy diet, thus upping the cost of healthcare. Addictions make us very selfish. Change calls for taking personal responsibility. And replace it with copious amounts of radioactive fallout and any kind of possible weapon waste product. After that noone will care about the environment. Evil brings evil, not a good deal. It is far more likely that the single most relevant thing an individual can do to limit carbon footprint is to not war--which is the number one polluter, expecially when considering the amount of resources it consumes. Of course, then there would be no jobs but grunt worker, old money bagger, and politician. The child thing definitely will not work, because if all the intelligent responsible minded stop having children then humanity is doomed anyway. Smart people should have lots of children, lots and lots and lots, a totally stupid amount of children ... because, as the article points out, the government and education system are not going to culture them to be so smart. Ohhh! But wait, how did this article become so popular? cfc do not make less carbon than incandescent--the amount of carbon consumed to produce and transport them consumes many times more than incandescent, and have already been outlawed in many areas for there rampant mercury pollution. This article uses data from a previous article discussed above, by Murtaugh and Schlax, which estimates the carbon impact of a child by all his descendants' emissions for the next 470 yeas, based on models of future carbon emission. But no such model is reliable for the next 470 years and that way of putting all those future carbon emissions on one child is an oversimplification (maybe one of his descendants will invent an engine that emits no carbon, or make a breakthrough in hydrogen economy etc.). 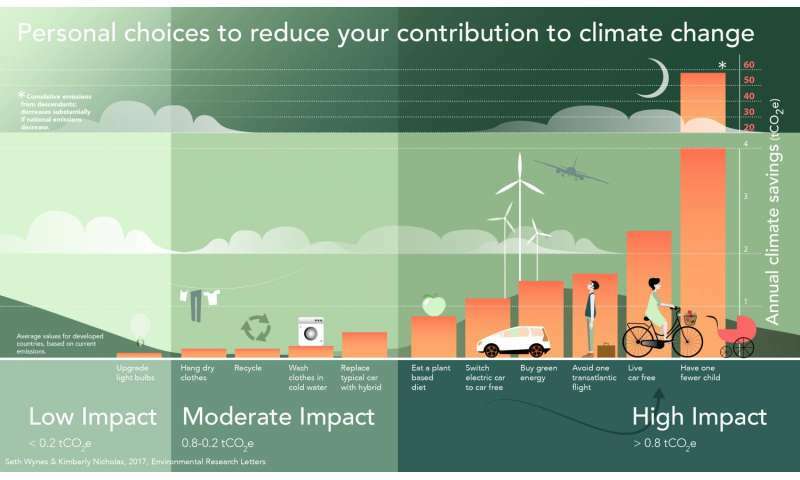 The climate savings figure for the "have one fewer child" option in this article is highly unreliable and probably grossly overestimated. Humanity will most probably stop burning fossil fuels long before that 470 year horizon. If you can make a video game that does that, they'll do it on their own. But then what happens if too much CO2 is sequestered? How do you stop them?